There is a story in Philippians 4 about two women called Euodia and Syntyche, who it seems were quarrelling. Paul was so concerned about this lack of unity, that he wrote a letter to the wider church in which he pleaded with them to ‘be of the same mind in the Lord’. Paul wanted to nip it in the bud. In our lives, conflict is inevitable. I think sometimes we are afraid of conflict and perhaps we think that as Christians, we shouldn’t ever experience disagreements? I believe that disagreements are normal and are to be expected – we are all imperfect human beings with our own struggles and agendas. However, while disagreements and differences of opinion may happen, we must always fight against division. I believe this is what Paul was trying to deal with in his letter to the church. Jesus spoke too on the issue of division. In Mark 3 he warned that ‘if a house is divided against itself, that house cannot stand.’ We must always guard our hearts, ministries and organisations against the poison of division. It is one of my biggest challenges as a leader, to ensure that disagreements don’t lead to a lack of unity. 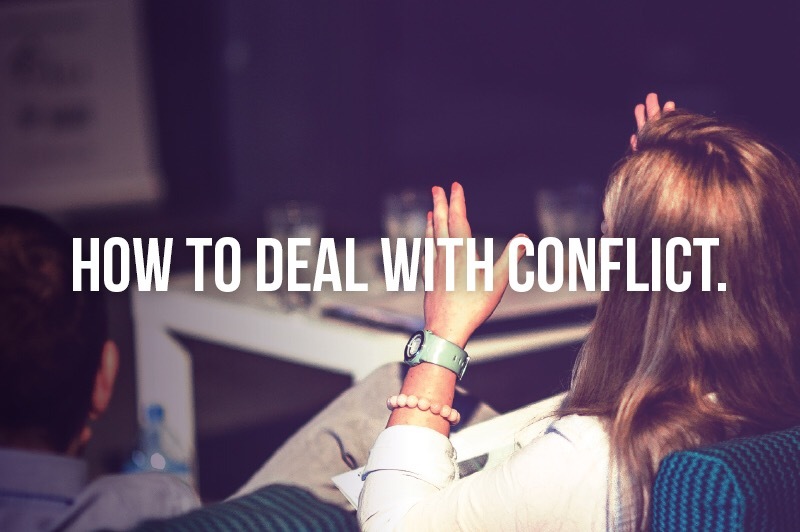 If you are dealing with conflict as a leader, or in your ordinary working life, here are a few ways to deal with it. If you are mediating between two people, it is important to listen. Take time to hear both sides of the story and prayerfully ask God for His wisdom and His solutions. It can be easy to get caught up in the emotions and forget to listen to what is being said. When I was a young man, I was very zealous and sometimes I made mistakes in how I communicated. The message of what I was trying to say may have been right, but the way I said it was wrong. Sometimes I look back now and think, ‘what a wally!’ But thank God, I had wise people around me who made allowances for my youth. Listening is an incredibly important skill. If we have to make tough choices or challenge bad behaviour, it is important to be decisive and clear. In his letter to the church, Paul dealt with the issue publicly and decisively. It may not be wise to deal with a matter publicly, but we can be intentional in our decision-making. If we say we are going to find a solution, we must make sure we follow through and do not dodge the issues. We have all met people who seem to enjoy disagreements and arguments. It is true to say that even with the best intentions in the world, God will not override the will of a person who does not want to change. If the will is there, true reconciliation is always possible, but you might need outside help. Do not be afraid to ask for help, by calling in a trusted advisor or mediator. Sometimes a person on the outside can bring clarity and a new perspective to the situation. Love is the key thing. I believe we can deal with almost any situation, if we choose to deal with it in love. This is not always easy – I understand, as I have been there. But, Christ’s love is the glue which brings true healing and reconciliation in relationships, marriages, churches and organisations. My role as a leader is to drive the desire for unity. But I need the Prince of Peace first of all in my life to make sure that I am operating from His agenda, not my own. When I choose to deal with issues in love, I can still challenge behaviour, but I can do it with grace. It does not matter how bad the situation is, if there is the will to change and be reconciled, I believe that any issue can be turned around. With the Holy Spirit in the mix, there is always hope for healing and for unity to be restored. If you are facing a situation that needs God’s restoration and would like our team to pray for you, please email us at davidlh@ucb.co.uk We would love to pray for you, so that unity can be restored. Thank you – a very thoughtful and inspiring piece, which I found just when I really needed it!